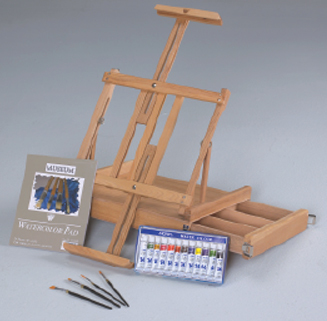 *The Weber VanDyck OIL Painting Kit includes, the incredible VanDyck easel, made of beautiful elm, and a unique design that allows the user to bring the artwork below the table surface, to avoid standing to reach the top of the canvas. * The easel is also equipped with a drawer with compartments for all materials. * Plus 12-tubes of oil Colors, 3- 9 x 12 canvas panels, and 4 assorted Taklon artist brushes, all in a full color box. (Shown with WC accessories).